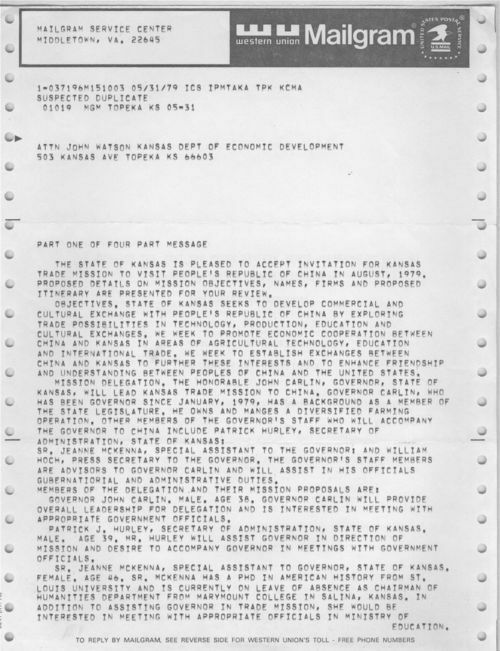 Governor John Carlin's office sent a draft telegram to John Watson of the Kansas Department of Economic Development for his review. The telegram describes a proposed August 1979 Kansas trade mission to China. In the message, the governor's office accepts China's invitation to visit the country, lists the members of the mission delegation, and proposes an itinerary. Governor Carlin led this and two other trips to China (in 1984 and 1986) to explore potential economic, educational, scientific, and cultural exchanges between Kansas and the Peoples Republic of China.